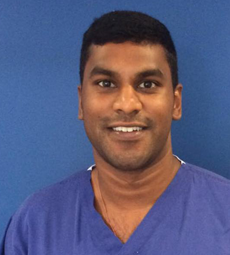 Rangika qualified from Cardiff University in 2010, and immediately undertook his Dental Foundation Training in Berkshire. Following the successful completion of his training, he has continued working as an Associate Dentist. In addition, Rangika is a Dental Foundation Trainer within the Oxford Deanery, a role that combines the development of newly qualified dentists whilst ensuring up-to-date current knowledge and skills being shared with his own patients. Rangika has particular interest in the fields of Oral Surgery and Restorative dentistry. To further his interest, he has worked in an Oral and Maxillofacial department in a local hospital, continually developing his aptitude and experience in this area of dentistry. Outside of dentistry, Rangika is an enthusiastic sportsman with a keen interest in football, cricket and golf.